One year and four births down, many more to go. Yesterday morning I woke up, and like so many millennials, I checked my facebook. Look, don't judge me. Trust me, I wish I could say that the first thing I did every morning was yoga, or read my Bible, or something more thoughtful, but it is what it is. This picture was taken on the last day of my Doula Training with DONA Trainer Rae Davies. This was the weekend that changed my life. I left that weekend more sure of my heart for birth work and my desire to pursue it! Somehow, simultaneously, I can't believe it's only been a year, and also can't believe how fast the year has gone. A year later, I have attended 4 births, and just booked my fifth. That number might seem small to you, honestly, it feels small to me sometimes, but it doesn't take into account the countless hours I have invested, or the contacts I have made over the last year. I have had tables at 2 different expos, read 15 books, became a member of The Tampa Bay Birth Network, built a website, attended half a dozen child birth education classes, done a hypnobirthing course, and attended my Postpartum Placenta Specialist training. Next week, I am attending my Certified Lactation Counselor training, finally! I registered like 9 months ago! 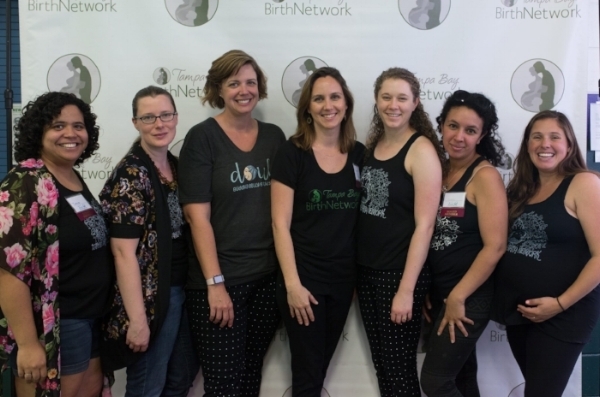 Most recently, I was asked to be on the board of the Tampa Bay Birth Network, which has been really exciting! I joined the team as the Membership Officer which will give me the opportunity to get to know more people in this community, and to share my love for birth and people. My first order of business with TBBN was helping with the Tampa Bay Birth and Baby Expo which was this weekend. Talk about diving in headfirst, but oh, man, was that event fulfilling! I feel so lucky to have experienced this last year as I have. I feel like things are really moving forward for me and that doors are opening. The day I decided to be a doula I received some of the best advice of my life. I was in the process of applying to Midwifery School and trying to figure out how the heck I was gonna afford it. At my doula training, which is a requirement for the midwifery school application, one of the faculty said, "Trust the process of getting into midwifery school. Don't force it if it's not the right time. Just like birth. We tell women to trust their bodies -- to trust the process of birth, and we tell you the same." So, that's what I have done this last year. Trust. My business isn't growing as fast as some others have? Trust. I can do more reading, and focus on getting to know more birth workers. I still have to work my day job? Trust. I am very lucky to have a day job that allows me to work my on-call doula schedule, and to make the TBBN meetings. Money's tight? Trust. I have been able to put a lot of money into trainings and certifications, and I am lucky enough to have roommates who are really understanding when rent is a few weeks late. Trust the process. Building any business is difficult, and a birth business is no exception. So, I am trusting the process. Thanks for reading! Don't forget to click subscribe at the bottom so you can stay up to date on my birth business.